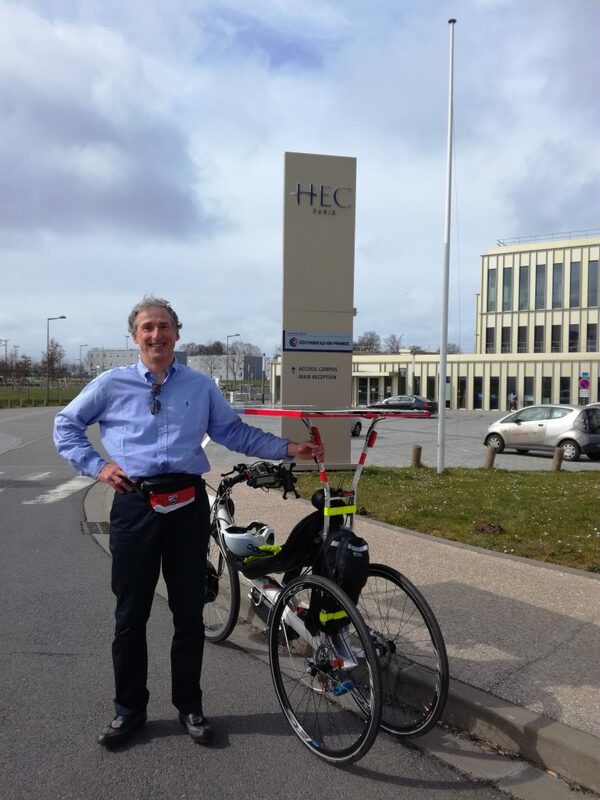 Today I was invited to present my solar bike to HEC, the prestigious Business university close to Paris. This was during the yearly ‘HEC Energy Day’, when several conferences are held around the economic challenges presented by new sustainable ways of producing energy. In particular my friend Sushil Reddy was presenting his new ebook (available under Amazon) where he describes his solar biking initiatives around the world. For me it was really fun to participate, very interesting with presenters from important companies (SNCF, TOTAL, ENGIE, GE). Last but not least it was also my birthday. So it is the perfect date to write my first post here on my new web site! Just arrived in the parking of the HEC Business school in the suburbs of Paris.